What you are about to read represents probably the biggest waste of time in my life, though that does not mean it will be a waste for time for you. This is my magnum opus against the false and stupid Bayside apparitions. For the past three years I have spent my spare time reading through every single message of Bayside, going all the way back to the late 1960s. Thousands of them. The monotony. The stupidity. The banality. It was horrendous, mind-numbing work, and many times friends of mine urged me to just drop it and move on to something more rewarding. It is waste for two reasons - one, just wasting my years reading all these banal, stupid messages; and two, the fact that, for those caught up in Bayside, nothing will convince them otherwise. People who are sold out to questionable apparitions are obstinate in their stubbornness and exceptional in their ability to fabricate excuses and work-arounds for all the problems that inevitably crop up when one puts ones faith in something so inherently dumb. So yes, I fear this effort was a waste. But, who knows. God may bring something fruitful from it. A word about the messages: the messages of Bayside delivered by Veronica Lueken are divided up by month and year. Some months have one or two messages; others have over a dozen. Some messages were short, others very, very long and rambling. They begin in 1968 and go up to June, 1994, when Veronica died. The text of the messages are taken from a website called These Last Days Ministries, commonly known as TLDM.org, which is the largest internet repository of the messages of Veronica. Now, there is some sort of schism among Baysiders regarding this website; some purists claim that the webmaster of TLDM has incorrectly transcribed some of the messages - these folks suggest the only "authentic" version of them are found in some books. However, this opinion is not universal, and even if TLDM has not transcribed the messages with 100% accuracy, they are not that different from what is found in the books, which I also had access to and compared some of the more saucier passages to. I have here simply categorized all the problems I see with the messages. Not everything is "heresy"; I am not making that accusation. Some of it is, but some of it is incorrect history, failed prophecies, weirdness or just plain stupidity. These all constitute "red flags" that should give pause to anyone evaluating the credibility of this apparition. According to my own personal standards of credibility, even one of these problems would be sufficient to cast doubt on the whole thing, but I understand others' standards may be different. I have tried to create categories to make it easier to read. Within each category, the actual messages of Bayside (or descriptions of what the messages describe) appear in bold with the exact date appearing afterward for reference. My commentary follows each selection. I have researched many private apparitions over the years, true and false, notable and obscure - Medjugorje, Garabandal, Fatima, Pinckney, Emmitsburg, the "Army of Mary" - Bayside takes the cake as the absolute stupidest, most unbelievable and ridiculously ludicrous of them all. I have created a table of contents for ease of browsing. For what its worth, enjoy. 5. Bayside Necessary for our Salvation? You'd think Mary would not get distracted by shiny things in the sky. Jesus and Mary need to get somebody's name and address!? You "forgot" that the Blessed Virgin Mother of God was returning to you? Saint Theresa - "You know, my sister, many of the names. Will you give some this evening to others?" "I ... have asked Our Lady if I could have permission to tell who Tusazeri is. Our Lady says I may. Tusazeri is one of the high archangels of Heaven who Jesus sent to be with me when Theresa started the Mission for Heaven in 1968. He was sent by Jesus to protect me in this work against satan. Many times I have forgotten to call upon him when there are difficulties" (Feb 1, 1973). This would mean that Veronica, alone in all of Christian tradition, has an archangel - a "high archangel" - as her personal guardian angel, presumably of the same rank with Michael, Gabriel and Raphael, the only other "archangels" known to Tradition. What hubris. In another place, Mary tells the faithful that they need no longer concern themselves with the work of evangelization in the world because this task has been entrusted exclusively to the angels! “My child, you must not use the little strength you have to try to convert all upon earth. You will have to give this to the angels to do most of this work of conversion. (May 26, 1979). The angels have many jobs in Scripture and Tradition, but evangelizing has always been the job of humans. As we shall see later, this withdrawal from active evangelization is part of the cultic exclusivity of Bayside, which encourages believers to simply withdraw among themselves and shun those who do not believe in the apparitions. And yet, on June 9, 1979, Jesus says through Veronica, "You cannot and must not break away and form your own groups." Repeat 77 3? Is this sound Catholic spirituality? "On August 4, 1968, at about 5:30 a.m., Veronica was in the living room making preparations for the early morning Mass. Suddenly this same framed letter went floating across the living room, as though propelled by an unseen, unknown force, and crashed with a loud noise at Veronica's feet. This turned out to be a little much." ("Occulations from Heaven", pg. 5). Is this how our Lord or the Holy Angels manifest themselves? Veronica's son Raymond, who was twelve years old in 1970, testified on tape on July 27, 1970 that the Lueken house was widely believed to be haunted by the neighbors due to some of these bizarre occurrences. "There will be one more most devastating plague upon you. That will come within the next six months, My children. You ask, My child, why is this allowed? My child, you have forgotten the real reason for all this: man will benefit from it in the end. (June 18, 1983). Obviously there was no massive plague in late 1983, let alone a "devastating" plague that "that your scientists will not be able to explain nor stop", as Veronica says in the same message. The Act of Contrition was never ejected from any official Catholic books, let alone in 1989. Woops. That century ended on December 31st, 1999. The "next war", at least from an American perspective, were the wars in Bosnia (1995) and Kosovo (1999), hardly a war "to the finish." Even if one ignored these conflicts and went on to the Afghan and Iraqi wars, these wars were nearly unilateral (not embroiling "many nations") and were certainly not "to the finish." "Within two years or less, there will be a great crash of the market. The whole world's monetary systems will be paralyzed" (June 18, 1988). Although there was an economic recession in the United States from 1990-1992, it was largely confined to the United States. The rest of the world was not effected, let alone paralyzed. Boris Yeltsin is identified as the man of sin but no mention is made of Putin, who is extremely more dangerous and sinister. Veronica clearly did not see Putin coming. "The end approaches" for Reagan? Too bad he lived for twenty more years. Wait...the antichrist is the man of sin (2 Thess. 2:1-12), which Veronica above identified as Yeltsin. So JPII was supposed to be exterminated and replaced by...Yeltsin? Or is the man of sin now different from the antichrist? At any rate it doesn't matter, because John Paul II was certainly not "exterminated", nor replaced by a despot, unless the despot is the meek Joseph Ratzinger who was so despotic that he voluntarily resigned the papacy in 2013. “You will send this message to John Paul II. He is in grave danger. I have asked him in the past to not make many trips away from his homeland—which is now the Seat of Peter in Rome (June 2, 1979). John Paul was of course the victim of an assassination attempt in May, 1981. Too bad it happened right in St. Peter's Square, not "away from his homeland" as Bayside suggests. It is also amusing how Mary warns John Paul not to travel "away from his homeland", but immediately realizing that this would mean Poland, and that as Pope in Rome he is perpetually "away from his homeland", she has to qualify the statement by saying that John Paul II's "homeland" is actually the See of Rome. These predictions of impending assassination were still being proclaimed in 1991, after communism had fallen. Notice that it says the U.S. was "surrounded." That's right - our country was surrounded. For this to be true, in June, 1984 we would have had to have hostile armies stationed along the Mexican border and stretched out all along the Canadian border, as well as at least some hostile naval forces on both our Pacific and Atlantic shorelines. Only then could we in any meaningful sense be "surrounded." Clearly this was not the case. But into 1986, Veronica is still suggesting that the United States is not only surrounded but also already invaded - covertly - by Russian spies! Given the amount of people necessary to fully surrounded and infiltrate the United States, this must have been a massive number of people. Where were all these Russian spies? Another imminent disastrous war prophesied on December 13, 1990. I suppose in all these cases the Baysiders can always say that these dire calamities would have happened had it not been for the prayers of the faithful Bayside devotees. It is very difficult to argue that something did not happen because of prayer; but it does demonstrate that the Bayside prophecies of future calamity did not come true despite being put forward as imminent; it also shows the non-verifiable nature of the Bayside messages. Jesus - "In those bags they are carrying all the implements of destruction." Veronica - Oh! I can see now; they're pointing across the street, and I recognize the Empire State Building. Oh, no! "Veronica - Well, I see two men. I don't know if they're Moslems. They have a different - colored skin, but they're not exactly black. Now they are walking through a building, and they're carrying with them, now, bags; but the bags are extra large, which makes it most suspicious. (Oct. 1, 1988). There simply was never an attack on the Empire State Building such as she described. How about missiles being smuggled into the United States from Nicaragua? No doubt this message, dated from 1987, was influenced by the unfolding Iran-Contra scandal. It is a prime example of how Bayside messages constantly play to the contemporary headlines but have little objective value. There was not, nor has there ever been, evidence of any missiles being moved into America from Nicaragua. Furthermore, the contention that Nicaragua is the "center point" for the capitulation is laughable. Too bad the collapse of the Soviet bloc and the fall of communism began only twenty-two months after this message was delivered. If the nations were supposed to gradually fall to communism, why didn't our Lady mention that communism itself was about to fall in less than two years? It can always be posited that the prayers of the Baysiders staved off the communist take-over; but note, the prophecy does not say that prayers will stop the nations from falling to the communist bear; it says that the nations are falling, and we are to pray that we do not fall with them. The fall of the nations to communism is taken as a given. This message was given in 1987. Lucy in fact lived for eighteen more years. He is not just alive in 1971, but already powerful enough to be gathering disciples. This means the Antichrist must have at least been an adult in 1971. If we were to say thirty years old at least, that would make him 73 years old today. If the conquest of the world about to be undertaken by a 73 year old man? Many times, the grammar of Jesus and Mary is just horrible. They say words that don't exist, use words in improper contexts, and sometimes, when Veronica messes up and says a wrong word, she goes back and tries to fabricate an explanation in order to preserve the farce. "I could repeat over and over the Message from Heaven of the past years. But I say to you: murders abound, immorality abounds... all the immunisms of humanism, lesbianism...homosexuals roaming. " (Apr. 14, 1984). What kind of word is "unjustment"? Discalculate!? That word doesn't even exist. Cajoler's!? Cajolery's!? For real? I am sorry; I cannot believe that Jesus Christ would use the word "cajolery." I may be wrong here, but our Lord seems to be using a vocabulary that is extraordinarily colloquial - I mean, to an absurd degree. "Therefore, I warn you now as your God: You will stop your intricacies within My Church. You will stop experimenting. I gave you the rules to follow many years ago, two thousand years approximately" (June 18th 1986). Aside from the weird grammar of "stop your intricacies" (intricacies is a plural noun and usually when you say 'Stop your x" the word in question is a verb), we see Jesus having to qualify His math. "Two thousand years...approximately"!? What happened was when Veronica said 2,000 years in 1986, she quickly realized that this would bring us back to 14 BC, clearly too soon for Jesus to have given any rules at all, so she adds the word "approximately" to the end of her statement to correct the embarrassing error. This is another demonstration of how Veronica uses feels compelled to have Jesus, Mary and the saints "correct" themselves when she makes embarrassing errors or, as in this case, statements that are just confusing. And what is a "dissentive discord"? "Dissentive" means "disagreeing" or "inconsistent." "Discord" means disharmony or strife. Clearly, Veronica meant to say "discourse" instead of "discord", and I don't know what instead of "dissentive" - maybe "descriptive" or "deductive"? Who knows. It reminds me of the old Oswald Bates' skits from In Living Color with the guy using all sorts of big words incorrectly. Clearly not the voice of an inerrant God speaking here. Pillar of stone? Woops. No way out of this one. "And if a priest or a minister even has the dare to blaspheme himself and tell you that don't worry about sinning, because one day you will even be a god" (June 18, 1982). "Even has the dare"? Does anybody use the word dare in that way? "I have asked you for the salvation of all souls. For mankind there will be no peace without prayer and penance and atonement. A great catastrophe is approaching your country, North America" (Oct. 6, 1980). "Your country, North America"? Jesus needs to go back to third grade to learn the difference between a continent and a country. “My child and My children of the world—and I call you My children of the world because I have repeated numerous times in the past that the messages from Heaven are for all mankind. (Aug 4, 1979). Upon realizing that "children of the world" is a biblical phrase not for believers but for unbelievers (Luke 16:8, 24:20) Mary has to quickly correct herself to explain why she addresses the faithful with a title the Bible uses for the unbeliever. "[Y]ou have been allowed to proceed in error because of your vain satisfaction, seeking of body pleasures, and because you have replaced your God with idols—humanism, idolism, destruction! (Aug. 15, 1971). Idolism? I presume she means "idolatry." If we look beyond the names of who is supposed to be talking and realize how this actually sounded when it was being delivered, it is easy to see that Veronica slipped up and forgot who was speaking. By having the speaker say "My Church", Veronica had to quickly clarify that it was now Jesus who was speaking. This is another example of how sometimes Veronica cannot keep track of who is supposed to be talking and has to offer retroactive clarifications when embarrassing or inaccurate statements are made. Mary called the Church "My Church", at which point she had to go back and clarify that it was actually Jesus speaking, which was then entered into the transcript of this locution. "O My children, listen to Me now: your children, protect them. Bar your doors to all but your immediate family and your closest workers within the circle of light. I tell you again this for reason" (June 18, 1981). "You will have now, My child and My children, additional torment and irritation from the followers of 666 and the church of satan. There are many who come as angels of light among you. I have asked all of the immediate workers within the confines of the circle of light to confine themselves to their homes, allowing only the entrance of their immediate families and the close workers within the circle for reason! For the souls of whom knock upon your door will be evil. Do not test My words, My children" (Oct. 6, 1980). "I have asked you, also, to bar your doors to all but your immediate family and the close workers of the circle. Allow no one within your home for reason. You are now on a list for extinction. (Oct. 6, 1980). "Be careful, My child, that you do not leave your home for any reason alone; that you do not allow entrance to your home on ground level. And I will send forth from Heaven an army of angels. Tusazeri shall guide you, and I shall have, with the permission of the Eternal Father, Theresa to assist you in the Mission" (Oct. 6, 1980). "In the distant heavens, there lived a most loving Spirit. First there was God, a God of love. Knowing love must be shared to be the fullest joy, He sort of subdivided Himself into a Family. For once even a spirit must share life eternal to reach the fullest degree of peace and joy. For love is in giving. He gave Himself to beget a Son and Holy Spirit. Even friendship exists between spirits, for our Father placed the angels to be a heavenly world, the light of love reflected from the Father, giving them all light sublime. Being so sensitive, He wanted this love to be given freely, not under obligation, so His angels and heavenly spirits were given a free will. Our Father's love outshone the darkness of disobedience. But the darkness soon reached the light, for Luciel, the most beloved of the angels, chose to forget this love of his Father and seek to covet the crown of authority. Our Father cried, the Trinity cried, and Michael fought for those who loved and shooed the fallen angels out to wander, the most despised of beings, living in the fires enkindled with [their?] evil desires. Heart-saddened over His loss, our Father sought to ease the pain of this loss by creating more family and calling him man. Placed in another land called earth, the loving heart of our Father knew the loss of loneliness and gave His earthly child a companion, Eve. All was paradise, a joy to our heavenly Father. But unknown to Him and His trusting heart was a snake in the grass starting to wreck His Heaven on earth. A devious plan took form. It was the battle of majesty between good and evil. All-trusting Blessed Father has ... [words unclear] to trusting Lucifer, who was that snake in the grass, that His new children would forever be faithful and true, not prey to the blandishments to a fallen angel. Lucifer whispered to Eve to eat of the tree of life [knowledge?] placed in the garden by the Blessed Father. This tree was a monument to the very weaknesses that got Lucifer kicked out of Heaven, a warning for watchfulness: avoid the fruits of this tree that would be so appealing to the body, but would sicken and kill the soul. Lucifer was really puffed up with his own importance and figured that here were candidates for establishing his own kingdom. Not Heaven on earth, but hell on earth! So many things beautiful to the eye have been man's downfall, and forbidden fruit the most tempting. The serpent's ... [words unclear] whispered on Eve proved the adage "out of sight, out of mind." Finding the deed more joyful than the awaited punishment that might lie ahead, since the wrath of our Father had not as yet descended, Adam would just have to share this newfound delight. With Lucifer's glib tongue, the delight grew sweeter by the moment. Using the oldest of feminine wiles, plus a few new tricks thrown in by the most obliging Lucifer, Adam was a cooked, literally, pigeon. No longer could our Father spare the children the sorrows of the tree of life, for they were now with a free will that could only be strengthened by love and asking forgiveness of the Father. So life began in earnest. Man would have to earn his way back to Heaven, or join Lucifer in his kingdom--the choice is his to make. On the left would stand Lucifer, and on the right all Heaven. By now the devilish creature has many helpers, but Heaven has the best of fortifications, the power of God. Lucifer pampers the body, Heaven will nourish the soul. Leaving the shackle of this body behind, we will fly off to eternity with joy, or find an eternity of misery burning forever in the very desires that brought us to this miserable end with Lucifer. Jesus tells us to keep out of that darkness and always in Heaven's light" (Tape Transcript, August, 1970, p. 5-6). A few things here: Veronica specifically says that in the beginning was only God the Father, which she calls the "Spirit." Then, at some later point, "He sort of subdivided Himself into a family." This is a very fundamental Trinitarian heresy, as God has always been Trinity from eternity past; there was never a time when He decided to "subdivide Himself." Furthermore, Veronica says that God "gave Himself to beget a Son and Holy Spirit; of course, only the Son is begotten by the Father, not the Holy Spirit. Original sin is repeatedly said to consist in eating from the Tree of Life - a major error, as it is actually the Tree of Knowledge of Good and Evil that our first parents eat from. Finally, in a statement reminiscent of Neo-Platonist Manicheaism, she states that "eternity with joy" consists in "leaving the shackle of the body behind", as if we would not be reunited forever with our bodies in the Resurrection. Are these sorts of blatant errors compatible with an authentic revelation of God? "Remember, My children, in the days ahead, your great comfort is the knowledge that there is no death" (June 18, 1980). This is Manichean dualism. The "real you" is the soul or spirit, the body is simply a "shell" or a "casing." This is also a great example of how far out some of Veronica's earliest messages were. "Remember, do not become a worshiper of the creature, but of the Creator; for the creature is the world, and the world is satan. The Creator is your God, and His world is the Kingdom of Paradise" (June 18, 1980). On the contrary, "The earth is the Lord's and the fullness thereof" (Ps. 24:1). There is a sense in which the world is said to be under the power of Satan (cf. 1 John 5:19, Luke 4:6); Veronica even uses this language further on in the same message. But it is extremely theologically inaccurate to say "the world is satan", especially in contrast to a spiritual Paradise. “Do not judge your brothers and sisters who have not been converted. For My Father’s House, My Son has repeated over and over: remember always that My Father’s House—there are many rooms in the Mansion, signifying faiths and creeds. However, the Eternal Father, the beatific vision, is reserved for the Roman Catholic following. This it has been deemed by the Eternal Father since the beginning of time" (Aug 14. 1979). This is very problematic. The "many mansions" verse that the Blessed Virgin cites here (John 14:2) has always been understood by Tradition to refer to heaven; heaven is, after all, "my Father's House" and where Jesus "goes" after His Ascension. And yet the rooms of heaven are said here by the Virgin to refer to "faiths and creeds"? Yet she goes on to say that the beatific vision is reserved for Catholics alone - "Roman Catholics" as she incorrectly states, referring to Catholics of the Roman Rite. Essentially, Bayside seems to be teaching that there is a distinction between heaven and the beatific vision, as if persons of many faiths and creeds can go to heaven, but within heaven, only Catholics experience the beatific vision. This is a grave theological error; the beatific vision is what heaven consists of. One cannot go to heaven but not experience the beatific vision. Those in Hell whose wills are fixed on evil are incapable of pleading for mercy, since to sincerely plead for mercy requires God's grace and a desire for the good. This is why the wicked in Revelation did not repent even when confronted with God's frightening judgments: "And the rest of the men which were not killed by these plagues yet repented not of the works of their hands, that they should not worship devils, and idols of gold, and silver, and brass, and stone, and of wood...Neither repented they of their murders, nor of their sorceries, nor of their fornication, nor of their thefts" (cf. Rev. 9:20-21). Souls in Hell can neither repent nor ask for mercy. Apparently, Veronica is not aware that the Rapture is not a Catholic doctrine. "When Our Lady spoke about Heaven, hell, and purgatory in the message, She was especially addressing the clergy, as some have lost the reality of the existence of hell. But they have especially lost the reality of the existence of purgatory. Thus She chose to use the word "forever," as this is earth's time, meaning till the end of time, or till the day of the final judgment. The intention being to impress upon the clergy the fact that purgatory does exist, and there are souls who will be in purgatory till the end of time. Naturally, at the end of the world there will no longer be a need for purgatory, and it will cease to exist. "Heaven and hell are forever" in the sense of the eternal, so naturally, they shall exist without end." Good clarification. Too bad purgatory was said to be "forever" in the same sense that heaven and hell are forever. The distinction "Mary" tries to make to cover this embarrassing error is completely arbitrary. We are used to clarifications from the Vatican Press Office, but from the Blessed Virgin? Not sure what to make of that one. This is also done in the apparition of June 18, 1984. Sacramentals must never be removed; "at no cost you must remove from your bodies your crucifix, the St. Benedict medal, and your Scapulars" (Oct 6, 1992). "Jesus: All who pray the Rosary and wear My Scapular shall be saved. All who place the crucifix upon their front doors shall be saved like the passing of the lamb." (June 18, 1984). The Bayside emblem is put on par with the Rosary and the Scapular! And the believer is told "you cannot do without any of them." Is this not extraordinarily presumptuous? Not even the Brown Scapular or the Miraculous Medal are said to be absolutely indispensable. "He is going across the sky now. He changed his mind about something; He had stopped short and was looking down this way, and then He just turned over to the left, and said: "Follow Me!" (June 18, 1988). Let us remember Catholic Tradition that gender is related to one's physical body; it is a way of being human. Angels by definition cannot have a gender because they do not have physical bodies. This is why angels in art are often displayed as androgynous. And to speak of the "age" of angels or whether there can be "baby" angels is even more ludicrous. While we can certainly do penance on behalf of other people, we cannot be contrite on behalf of others; contrition is a personal act expression sorrow for particular sins. We can do penance for others, but not repent for them. This is bad theology. "One day, My child, the waters will come up at Bayside, and I will appear over the old church building. Your Bishop then cannot deny My Appearances" (May 17, 1986). If this is true, it is an affirmation of the fact that the bishop does, in fact, deny the Bayside apparitions - otherwise, how could Mary say that one day he would "no longer" deny them? And if he does in fact deny them, then the faithful are to regard them as condemned, for the bishop has final say in matters of private revelation within his own diocese. Because America has never been a Catholic nation - certainly not at the time of its founding or in the "happy" old days. How could a country founded on Protestant Deism be referred to as "devout, pious, and following the road as given by the Eternal Father"? This could only be true if one presumes the truth of the Protestant narrative about the founding of this country, which Veronica apparently does. Now this is actual heresy. Faith is a theological virtue proper to viators, those of us here on earth on our pilgrimage of faith, those who "see through a glass darkly" (1 Cor. 13:12). Faith exists because our knowledge is partial due to our creatureliness. But when we attain heaven and the beatific vision, faith will pass away as it terminates in knowledge. Nobody in heaven has faith, especially God, who is pure act and possesses supreme knowledge. To assert that those in heaven have "faith", even Jesus Christ, is a shocking ignorance of Catholic theology, offensive to pious ears, and heretical. "...remember well what had happened in Rome to John, Pope John, whose reign lasted 33 days. O My child, it is history now, but it is placed in the book that lists the disasters in mankind. He received the horror and martyrdom by drinking from a glass. It was a champagne glass given to him by a now deceased member of the clergy" (May 21, 1983). I'm not sure that someone who is poisoned and doesn't even know they are being assassinated can be a martyr. Part of being a martyr is willingly laying down one's life for the faith. If you are just sipping a glass of champagne and don't realize it is poison, where is the will to die for Christ that is essential to martyrdom? "My child and My children, I beg of you, through the Trinity - the Father, the Son, and the Holy Ghost; and I am in God, I was in God, and I always will be in God" (June 18, 1983). I don't approve of communion in the hand, but to say it has "never" been accepted by heaven cannot be true, since it was practiced widely in the Early Church. Sure, one could say it was not practiced in the same way in the Early Church as it is today, but Bayside does not make that distinction. "You must now assume a great responsibility for the salvation of your children’s souls. Do not expect this to come from Rome, for Rome now is under great attack. 666, satan—Lucifer and his hordes of demons now are in control of Rome" (May 23, 1979). If Lucifer and his demons "are in control of Rome" and we must not expect any spiritual direction to come from Rome, has not the promise to Peter become null and void? We must be careful here; it is one thing to say that Satan has infiltrated the Church, that there are those in the hierarchy under his control, but to say that Satan is "in control" of Rome stretches what most orthodox Catholics are comfortable with regarding the Traditional understanding of the Roman Pontiff. "Why are you now planning to take married men, making them what you call deacons, to give the sanctity and holiness, the grace in marriage to My sheep? What right have you to change the rules and the direction? Understand well: when I appointed the Apostles there were no names given as cardinals or bishops; but Peter was the first Pope, the leader, and would you say not that the Apostles were the first bishops? And after that they chose from out of multitudes, seven whom you call deacons and listed as deacons, but they were truly priests at that time. But you do not need the procedure now. If you are willing to ask the Eternal Father, and if you do not give yourselves over to doctrines of demons, you will have priests sufficient to carry out the ministry. But what do you do now? You will seek to make instant priests, against the will of the Eternal Father! You will delude others to think that your deacons can take the Sacraments and give them as in the priesthood! A priest, My children, is a chosen man of God. A true legally-ordained priest is far superior than any man, as he represents Me in the Godhead" (May 23, 1979). Veronica appears ignorant that deacons were married in the Early Church. She also errantly presumes that deacons were "truly priests"; whether she means they were priests before they were deacons or that the deacons carried out the function of priests I do not know, but either way she is theologically and historically incorrect. It is true that deacons can administer certain sacraments, and this has always been the case. Her ignorance of history and sacramental theology is blatantly obvious here. Baptism confers an indelible mark that can never be effaced. It is impossible for a baptized Catholic to die as anything but a baptized Catholic. What is the purpose of this warning? It is impossible to become "unbaptized." It is also questionable the manner in which she uses the term "Roman Catholics" since it in its technical definition it applies to those Catholics of the Roman Rite only. Jesus is apparently thinking of "the Church" only in terms of the Roman Rite. Would Mary really refer to the pope as "Our Father"? This is weird, since all popes have referred to Mary as their Mother. And why would Mary call him "Our Vicar"? He is the Vicar of Christ, not the Vicar of Mary. "Our lawfully ordained, blessed priests will always have the power to bring My Son in physical Body to you. The trappings, as such, My child, placed on the procedure by man are as nothing, for you will live in the spirit, not in the aspect of worldliness and decoration. All that has been destroyed and removed in My Son’s House are but symbols" (Oct 6, 1971). "And whereas such is the nature of man, that, without external helps, he cannot easily be raised to the meditation of divine things; therefore has holy Mother Church instituted certain rites, to wit that certain things be pronounced in the mass in a low, and others in a louder, tone. She has likewise employed ceremonies, such as mystic benedictions, lights, incense, vestments, and many other things of this kind, derived from an apostolical discipline and tradition, whereby both the majesty of so great a sacrifice might be recommended, and the minds of the faithful be excited, by those visible signs of religion and piety, to the contemplation of those most sublime things which are hidden in this sacrifice." "I beg you more than if it were a question of myself that, when it is becoming and you will deem it convenient, you humbly beseech the clerics to venerate above all the most holy Body and Blood of our Lord Jesus Christ and His Holy Name and written words which sanctify the body. They ought to hold the chalices, corporals, ornaments of the altar, and all that pertain to the Sacrifice as precious. And if the most holy Body of the Lord is left very poorly in any place, let It be moved by them to a precious place, according to the command of the Church and let It be carried with great veneration" (St. Francis of Assisi, Epistola ad Custodes). Is this heresy? Perhaps not. But it is a form of liturgical minimalism that has proven to be extremely destructive to Catholic faith and worship and can hardly have come from Heaven. "Gather your brothers and sisters—do not lose one—and build a strong link to Us. Yes, ransom these souls whom Lucifer has bought." (Sept. 21, 1971). In no way has Catholic theology - even among the various schools of thought on how Christ redeems man - ever suggested that Lucifer "bought" mankind. It is Christ who "bought" us at a great price (1 Cor. 6:20), who "purchased" us with His blood (Col. 1:14) and who pays; Christ is the one who buys mankind; Lucifer has never "bought" mankind. "You will teach the children that We are truly living peoples, that We live in the heavens, just a short distance from the farthest star" (July 1, 1971). Veronica Lueken's heaven is located entirely within this universe, just a short distance from the farthest star, and not far from Never-Neverland. Hopefully a discussion on the fact that heaven cannot be located within this physical universe is not necessary. Heaven cannot be a place with a physical location within Creation. In Catholic Tradition, we sometimes speak by way of analogy about "comforting" the Sacred Heart of Jesus by our company during our Holy Hours, drawing a parallel between the Apostles who left Him in the Garden of Gethsemane and our own time spent with Him in adoration. Of course, this is analogical language; Jesus is not "lonely" and He does not "need" our comfort. Speaking, however, about God the Father as needing our rosaries to "lighten" His heart is extremely bizarre. Even if it is only meant by an analogy, it is an analogy that find no place in the Church's traditional spirituality. “Each man on earth who has been baptized and set himself up as a follower of My Son in infancy has received the mark of the cross upon him. He can in his lifetime cast this away and be branded with the mark of the beast" (Dec. 31, 1972). "Incorporated into Christ by Baptism, the person baptized is configured to Christ. Baptism seals the Christian with the indelible spiritual mark (character) of his belonging to Christ. No sin can erase this mark, even if sin prevents Baptism from bearing the fruits of salvation" (CCC 1272). According to Catholic Tradition, eternal salvation is the primary purpose that God sends private revelations to individuals. The Catholic Encyclopedia notes that a revelation is suspect if the visionary seems to be answering idle speculations or settling disputed questions in matters of history, theology or astronomy. Yet we see just this in Bayside, where the content of the messages contains some extreme banalities. Is this really the sort of information we could expect God or His Mother to wish to communicate to us? The nature of flying saucers? I hope there is one coming up about what Sasquatch sightings really are. That was very nice of Jesus to come from Heaven to explain to us the vicinity from which He obtained the boards He was crucified on. I had always wondered about that. "And it's a little windy up there this evening, because I can see Jesus's feet now. He does have on sandals. They're made of a brown leather-like quality. I can't explain it. It looks almost like a thong, just one piece of strapping down through His toes, and one across His instep. And His feet are bare. He has no socks on, or anything; His feet are really bare. But...He is smiling. He thinks this is funny." (June 18, 1987) "
Jesus wants us to know that the thorns were inside a basket and that it was actually a basket of thorns that was forced on his head? What possible purpose if there for including this detail which is of no practical significance? Is this not a prime example of the seer's preoccupation with externals or frivolities of the apparition. Why is it of such importance that our traditional "false notion about His crown of thorns" be corrected by a private apparition? Satan himself is on one of the transports!? Satan personally is riding around in a UFO? Is this really relevant to our salvation? Perhaps this is a metaphorical way of saying "I have suffered", but since our Lady and our Lord have perfect knowledge, they would never use such sloppy language. Our Lady could have never had a purgative experience since she had no sin, let alone an experience of suffering punitive punishment in some kind of hell-like experience. This is why theologians teach that not even Christ, for all his suffering, experienced the pains of the damned - unless you are a Balthasarian heretic. Veronica - "I see a road. It looks like a normal country road, but it leads to a city, a great city. I would say from the buildings that the city looks like New York. But I see there are very sinister - looking characters walking down the road nonchalantly but carrying bags. Within those bags there are submachine guns." Now, one might say that this has been fulfilled in the September 11th attacks or the 1993 World Trade Center attacks, which involved bombs and attackers with "dark skins." But our Lord specifically says that these attackers come from "a Communist nation" and that "submachine guns' are involved. This is just absurd. I don't know what else to say. "My children, that you guard yourselves well against this plague. If you must have a form of operation requiring transfusions, I would suggest that you have a member of your family donate this blood; for the other has been grossly - I say grossly - contaminated and will cause many deaths" (Oct 6, 1988). Blood has been screened for HIV in the United States since 1985. Contamination from blood transfusions world wide account for only 5-10% of infections. This is simply a falsehood, and further more, not at all relevant to the message of eternal salvation, which all legitimate private revelations concern themselves with. I'm not positive, but I am pretty sure that when Jesus speaks through a seer, He does not quote Franklin Delano Roosevelt's 1933 inaugural address. "Michael is very difficult to describe. He is so huge! A real warrior of Heaven. But I cannot see his features; there's something about Michael that his features are unexplainable, like the spirit. But he does look gorgeous. His hair I do see. His hair is a golden color. That is why Our Lady names him, `Golden Boy'." (May 17, 1986) "
I know that with the Lord a day is as a thousand years and a thousand years as a day, but seriously, is there any precedent anywhere in the entire Catholic Tradition of our Lord referring to our 365 day year as an "earth-year"? It makes Him sound like an extra-terrestrial. This is not proof that Bayside is wrong; it is evidence that it is just bizarre, and very common, especially in the first decade of messages. “You must understand that the forces of evil are cunning in their trickery. They will not expose themselves to you in their true light. They work behind a screen. My child and My children, I will explain this to you more simply. Do not be deceived by the mushrooming centers that house diabolical agents from hell that are now encased in a human body" (June 14, 1979). Mushrooming centers that house diabolical agents from hell encased in human bodies!? What!? "And now coming out of the sky, I see a very comical-looking figure. I think he’s comical; then again he’s kind of frightening. His face is extremely fat, and his teeth are huge. But he looks like an Oriental of some kind. He’s smiling in a very strange way. I notice he has—he’s short and has like a stubby type of body. But he’s grinning in a very evil-looking way. As he stands with his hands behind him, he’s looking about now and it looks as though he’s waiting for something. Oh, my goodness! Now he’s bringing out from behind his back what appears to be a long tapered candle. And he’s reaching up now. The candle has a light on it; it looks like he’s about to touch the wick on the bomb. It looks like a bomb, but it looks like the world with a wick sticking out of it. Oh, my goodness! He’s a very—I don’t know who he is; I don’t recognize him. But he’s an Oriental and has very large teeth; and the grin, even, the way he’s grinning makes his teeth very—kind of prominent. But he has—I must say he gives you a feeling of fright because his smile is very evil. Now I can’t see him. It’s as though a veil is being placed over the scene" (July 25, 1979). A fat oriental with a big grin and big teeth? 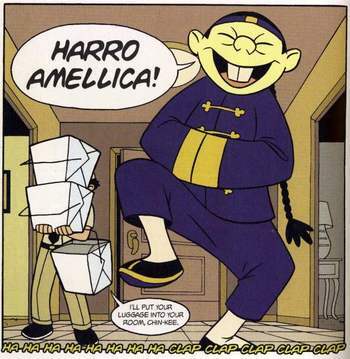 You mean like, this stereotypical grinning, buck-toothed Asian? Complete with the Yosemite-Sam bomb and smoking wick. This is laughable. Where is Mary, or any saint, described as "roaming the nations" or "walking the earth?" This is very unorthodox language; saints, especially the Blessed Virgin, are always referred to as residing in heaven and interceding from heaven. There is one who is described in Scripture as "roaming about" the world and "walking to and fro" upon it, but it is not Mary or any saint (cf. 1 Pet. 5:8, Job 1:7). See also the message of May 30, 1971 for our Lady "wandering" the world. “I have arrived much earlier, My child, than expected, for I am busy in all parts of the world. There is much turmoil." (May 30, 1971). Mary had to change her plans and arrive early because world events messed up her schedule! "Among the wonderful technological discoveries which men of talent, especially in the present era, have made with God's help, the Church welcomes and promotes with special interest those which have a most direct relation to men's minds and which have uncovered new avenues of communicating most readily news, views and teachings of every sort. The most important of these inventions are those media which, such as the press, movies, radio, television and the like, can, of their very nature, reach and influence, not only individuals, but the very masses and the whole of human society, and thus can rightly be called the media of social communication. The Church recognizes that these media, if properly utilized, can be of great service to mankind, since they greatly contribute to men's entertainment and instruction as well as to the spread and support of the Kingdom of God" (Inter Mirifica 1-2). "My child and My children, I want to tell you also at this time: You are not to concern yourself with other words and writings of apparitions in various places. I can tell you, My children, unfortunately there are those are caught up in the excitement of the times and My appearance at your site. However, you cannot become involved, My child or My children, with any of these apparitions; it is best to ignore them." (Mar 18, 1989). "My children, you will read and re read the messages from Heaven given through My Mother to you. Read them well, for much has been over looked in the past. You will receive great knowledge, and you will be able then to know the day, the hour of the tribulation." It is difficult to understand in what sense we are to "not speculate on dates" when we are subsequently told that if we reread the messages we will find "great knowledge" to figure out the day and even the hour of tribulation. If we can know the day and the hour, how are we to not speculate on dates? This has led to the absurd practice of Baysiders examining the messages and photographs of Bayside for cryptic messages about the time of the Tribulation and Great Warning. For example, see here. "There are over 10,000, now, cults in the United States and Canada alone. Many children have been slain by them in sacrifice to satan." (June 17, 1989). While it is undeniable that Satanism exists, is it realistic to posit that most children who are missing are taken by Satanists and sacrificed? Is 10,000 Satanic cults a realistic number? Veronica's teachings here reflect the Satanic panic of the 70s and 80s more than empirical evidence. A famous 1988 study by America sociologist David Finklehor found only 36 cases of Satanic ritual abuse in the whole country (these numbers were even questioned because his criterion were so broad). Two famous Satanic murder trials - the McMartin preschool trial and the Adolfo Constanzo murders - failed to produce any evidence of Satanic inspiration. A 1996 study of 12,000 reported cases of Satanic abuse revealed that not a single one was corroborated or even consider sufficiently factual. In fact, no evidence has ever been brought forward corroborating a single act of Satanic murder, despite extensive investigation. The simple fact is that the "10,000 cults" of Veronica with their extensive murders do not exist. "I see a lot of people gathered there. Now I would say about fifteen, or maybe seventeen, I'm count... no, thirteen, there are thirteen people. Now they're all standing in a circle. And in the middle of that circle is a man. He's dressed with horns on his head, like satan, and he has a black cape which is red inside. And he's turning about and he's holding a spear in his hand. It has three prongs on it. And he's dipping these prongs now into a boiling big kettle. I believe it's water boiling... he's heating up. And now he's placing - after putting water, he dips his fork, this big fork, into the water, and then places it on top of the hot coals and they sizzle. (Veronica gasps.) And now he's going over... and there's a man tied, just like Jesus was, to a post (Veronica gasps again)... and he's taking this horrible, horrible thing in his hand and he's burning the skin of the man... I can hear his screams, the man is screaming... he's burning the prongs of the pitchfork on the man's back. Now Our Lady knows that I am getting dreadfully ill. It's a horrible sight. Now - ohh! Now one of the - there's a woman there, she - her eyes are glassy, like she's drugged or something - now she's going over to the man and she's taking a - it's a long knife, like a hunting knife, and cutting him in his back. And then - oh my... oh no! Then there's another woman - they're all dressed in black canes with red on the interior - there's another woman, she's going over... and - oh no! They - she has - oh, she has a chalice in her hands and she's placing it underneath the drops of blood that are coming out of the gash she's made in the man's back. And they're all laughing, like they're hysterically insane. They're all laughing." (March 18, 1983). All that's missing from this description is the red tights. If you somehow read through this entire thing and still have absolutely no doubts about Bayside whatsoever, I don't know what to tell you. At that point I would probably suggest you take a step back and examine the very definition and concept of "credibility."